I’ve long now stopped being a mystical person or a believer in any sort of dogma – which, contrary to what some might think, has made me much happier, calmer and more understanding. And despite a recurring in-joke that I make reference to in the title of this post, I do not believe in fate or that “things happen for a reason”. I mean, they do happen for a reason, but generally that reason is right here, in our world, and it tends to simply be other people. People make good and bad things happen (well, nature does as well, but we all know by now that people have influenced nature an awful lot). So I’m writing this post about one particularly good week I had in Edinburgh, when some of the good people in my life provided me with much needed positivity at that point. I was supposed to leave Scotland a couple of days after the Referendum, but considering that my Visitor Visa allowed me to stick around for six months, I decided to change my flight back and stay until January. I wasn’t allowed to take up employment and the money I had brought with me for my time away since I left for Spain in June was running out, but with the help of my ridiculously generous friends and some cash I made from working for a translation office back in Brazil, I managed the extra months (the internet is a wonderful thing). And this week at the start of November made the effort worthwhile, because everything felt normal for the first time in ages. To begin with, I got to direct a short piece for Collider, an event organised by fellow theatremakers at Discover 21. I hadn’t planned on taking part, but I was asked to stand in for a friend who was ill, and I had no idea that a short, simple thing would make such a big difference. It was so refreshing as well, as I hadn’t worked with scripted theatre for a couple of years and it was great to flex those muscles. A couple of days later, I was invited to participate of the audition panel for Charioteer Theatre‘s upcoming show, A Bench on the Road. Again, it was something I hadn’t done for a while and it was incredibly gratifying – particularly because I got to meet dozens of talented Scottish actresses of all ages. Finally, I had a special friend visiting from London at the weekend and we had a great time out and about in Edinburgh, during which the photo below was taken. This is relevant because I posted the photo to facebook and it was my all-time most liked picture there, with many comments stating how happy I looked. 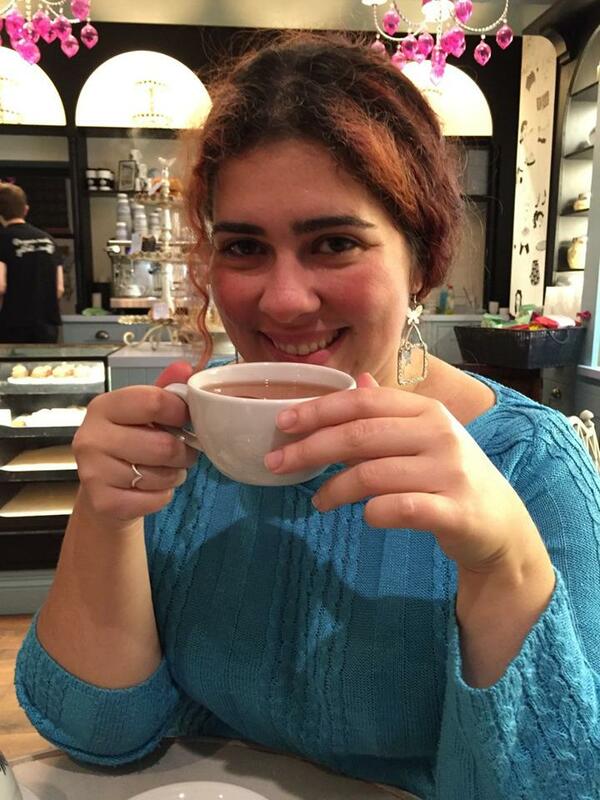 It’s just a photo of me drinking a cup of tea, but I think facebookers were right – I did feel very happy then, and I think it just showed. Choosing to stay a little longer in Edinburgh was the right decision. I spent a lot of time at the computer working on my translations, which I could have done back in Brazil, but there is a massive difference in being able to do it while Jen throws Jaffa Cakes at me and Mark makes endless cups of tea, and then signing off to go meet Pam and Jenni for dinner and cinema, or Dawn and Leila for drinks, or Julia for coffee, or drop by Fiona’s work, you get the gist. Synergy is when different parts combined achieve an effect that is greater than the sum of their separate effects, and that is definitely what I experience when I am in Edinburgh with these people.